Home / Amazing / Unbelievable Facts About Pablo Escobar, The World's Most Dangerous Drug Lord! Unbelievable Facts About Pablo Escobar, The World's Most Dangerous Drug Lord! First things first. If you still haven't seen Narcos, then stop everything you are doing right now and make it your top priority. Because once you are done binge-watching it (yes, it's that good - I pulled an all-nighter for it), you would be a hundred things wiser. Because Pablo Escobar is a name that you can't afford not knowing. Because Narcos is undoubtedly one of the greatest shows to have ever been made (remember Breaking Bad?). A quickie before we dive into the fact sheet on Escobar. Set in the 1980s, the show chronicles the life of Columbia's most dangerous drug lord and courses through his climb to power from a mere cocaine dealer to the owner of the Medellin Cartel. This 10-episode show is wrought with so much bloodshed that by the time you reach the finale, you are already crying for season 2. Starring Wagner Moura as Escobar, the show strikes a perfect balance between the subject and the actor - the resemblance between the two is so uncanny, it makes you feel you have been taken back in time. 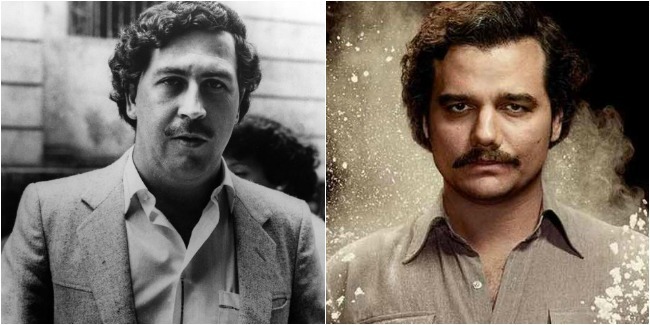 So without further ado, let's take a look at 12 most 'addictive' facts about Pablo Escobar. 1. Before becoming a drug kingpin, Escobar sold stolen cars and tombstones to smugglers. 2. Escobar's open support for the poor and his wish to become Columbia's president earned him the nick name 'Robin Hood'. 3. After becoming the reigning lord of Medellin Cartel, Escobar was minting as much as $420 million a week! 4. His drug trade flourished so much that he was smuggling nearly 15 tonnes of cocaine every day! 5. So much so that he smuggled cocaine into the United States by hiding it in airplane tires. 6. To handle the free-flowing wealth that came his way uninterrupted, Escobar bought a Learjet for the sole purpose of flying his money. 7. At one point, Escobar's had amassed so much wealth that it reached 30 billion dollars! 8. The man had so much money that he spent $2500 a month just on rubber bands to bind his money together. 9. Once in hiding, Escobar even burnt 2 million dollars to keep his daughter from catching cold. 10. Escobar's greatest fear was extradition and he unleashed horror upon Columbia just so that he could avoid jail-time in America. 11. So great was his fear of extradition that Escobar offered to pay off Colombian government's debt that had reached a massive 10 billion dollars! 12. As per an agreement with the Colombian government, Escobar built a luxury prison called 'La Catedral' that was guarded by his own loyal servants. The terms dictated Escobar to serve prison time (which he did) and the Colombian government to not extradite him to the US. The prison was anything unlike any jail. A thriving casino, spa and nightclub from inside, La Catedral became the hub of more drug deals and murders. 13. And this horror included killing 4000 people that included murdering 200 judges, 1000 policemen, journalists and government workers. Escobar was shot dead in 1993 by a special police force after being on the run for 7 months. The man who raised an empire so big that it instilled fear among the living, a brutal end seemed a befitting epilogue to his powerful narrative.